Sometimes my desire not to waste ingredients is at odds with my desire to cook the best-tasting food possible. I’ll try use up a stale heel of bread, then kick myself for not just buying a fresh loaf to soak up my soup. But what about garlic cloves that are sporting some green sprouts? Will using them have any effect on the flavor of my final dish? Jason Hovell, owner of Tamarack Garlic Farm in Trempealeau, Wisconsin, tells me this is an especially relevant question in the spring, because the gourmet garlic that is sitting on kitchen counters right now was probably harvested last June or July. Come spring, the clove thinks it’s time to grow. Hovell says he detects a slight bitter taste in the green portion of the sprout but not the rest of the clove about two weeks after first noticing sprouting on hard-neck garlic. He suggests storing garlic in a cool, dry place—not the refrigerator—to keep it fresher longer. A brown paper bag in a pantry is ideal. 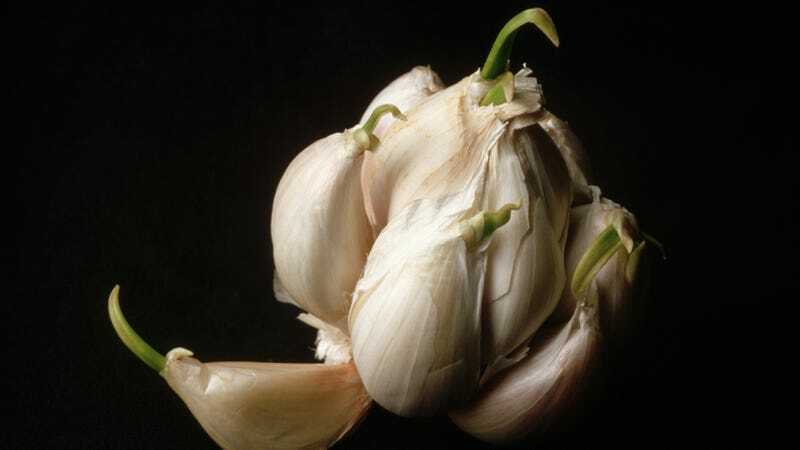 Andrea Geary, deputy food editor of Cook’s Illustrated magazine, also finds sprouted garlic to be more bitter than normal. The magazine advises people to cut a sprouted clove in half lengthwise to remove the sprout with the tip of a knife before cooking with it. This method is chef-approved; chef Sarah Grueneberg of Chicago’s Monteverde tells me that while she doesn’t like using sprouted garlic—“it loses its sticky-spicy garlic notes”—she’ll use the sprout-removal method if she’s cooking at home and in a pinch. There is, however, a threshold at which you should just toss the garlic. Geary says if the sprout is three inches or longer, just chuck the head. That’s because the sprout’s used up most of the sugar in the garlic to grow, leaving the entire clove bitter.